It’s not very often that I get to see a young player that has size, speed, and athleticism all rolled into one. 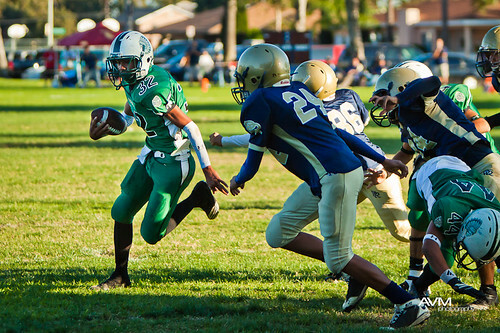 Then again, I don’t get to see youth football games very often either. Well, thanks to Crystal I got a chance to see and photograph her son Junior play. Against their rival team too! So that I could get better photos of him, I asked Crystal the usual questions like what position he plays, how often does he play, does he play other positions, blah blah blah. Well she told me he plays just about everything, both offense and defense, and pretty much plays the whole game. Oh… and he’s going to get the ball a lot. Wow was she right! He got the ball a lot! And when he was playing defense, wherever the ball was, he was there. He was all over the place! He scored 2 touchdowns (one of them being this run) and 2 conversions with one of the touchdowns being a 40+ yard run and I don’t even know how many tackles he had. He was phenomenal! Alas, even after his valiant efforts, they lost the game. But at least I got to see a great kid and a great player play. Maybe even the beginnings of a future great NFL player. Now that would be cool!